I would like to take this opportunity to tell you how much I appreciate your excellent training program. The results that I’ve attained in the program have been quick and relatively painless. Your trainers are truly knowledgeable, and I have a lot of confidence in their judgement as well as their training. You have exceeded my expectations in terms of your qualifications, competence and responsiveness to my special requests for modifications. I always feel that in each session I, an individual, am being trained and improved. Never do I feel that I am following one of a few “canned Programs”. The training facility is always very clean and quiet, qualities which make it a pleasure to be there. 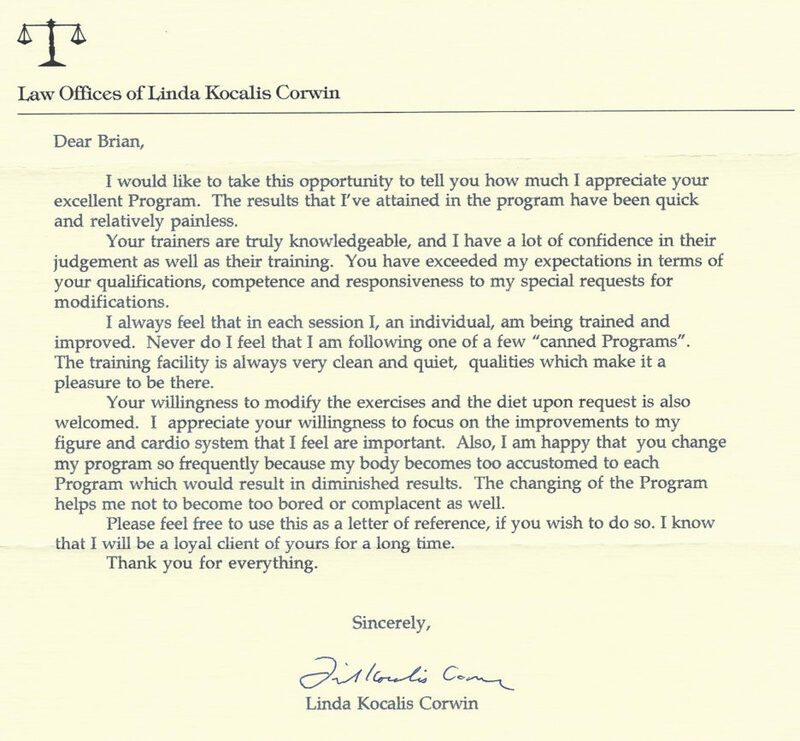 Your willingness to modify the exercises and the diet upon request is also welcomed. I appreciate your willingness to focus on the improvements to my figure and cardio system that I feel are important. 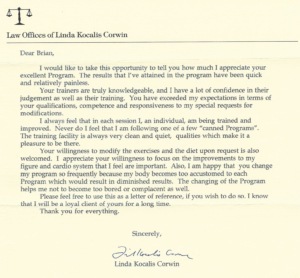 Also, I am happy that you change my program so frequently because my body becomes too accustomed to each Program which would result in diminished results. The changing of the Program helps me not to become too bored or complacent as well. Please feel free to use this as a letter of reference, if you wish to do so. I know that I will be a loyal client of yours for a long time.